Since becoming the mining sectors first licensed drone operator in South Africa, RocketMine has had the opportunity to compare its data with traditional methods used by a South African mine. A case study was conducted to test the data accuracy of drone technology in contrast to usual methods. Accuracy is particularly important in areas of difficult, complex, or loose terrain, busy roads, and areas where there may be undetonated explosives for blasting. The aim was to compare RPAS data to traditional terrestrial methods. A coal mine was identified for the survey. A blast profile was identified, and pre-marks were placed around the area of interest. These points were initially surveyed using a GPS instrument with surveyors and then sent to RocketMine for an RPAS measure on the same blast. The data from the two surveys was sent for analysis. What took the terrestrial survey hours to collect and process the data, took RocketMine 25% less time to collect and process. The surveyors’ personal safety was not considered as they were physically walking among loose rocks and steep inclines; furthermore, there was no guarantee that there were undetonated explosives around the area. There was also a high wall they could neither climb over nor take readings from. 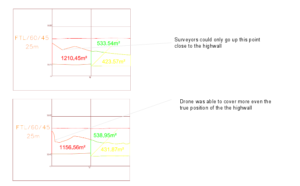 At the end of the survey, the RPAS data collection contained more detailed than the GPS data collection. 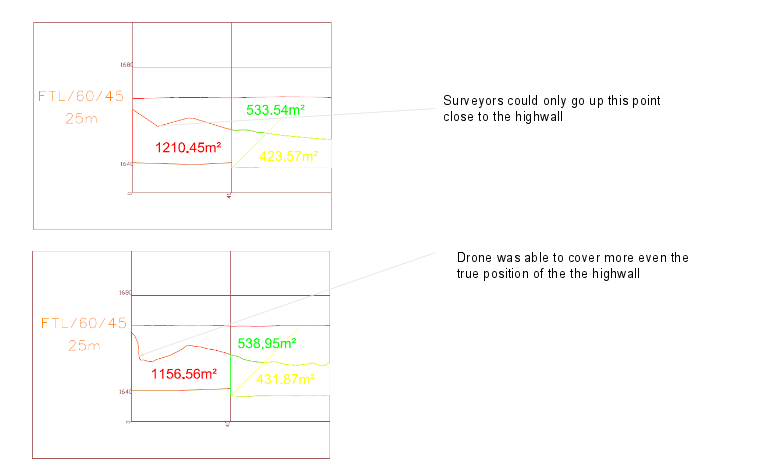 The RPAS was able to take measurements from above the high wall the GPS was previously unable to. After plotting the data from the RPAS measurement, the pick up did not move from the designated area. Thus in terms of geo-reference, the data collection was accurate. A high wall that proved to be a challenge for tradition surveyors as a lot of detail was left out due to not being able to take measurements close to the wall. An electronic copy can be found below.